I’m presenting this photo twice, once in the header and again in the body of this post, since the header format of this blog template is kinder to horizontal images, and I’d like you to see the full image. 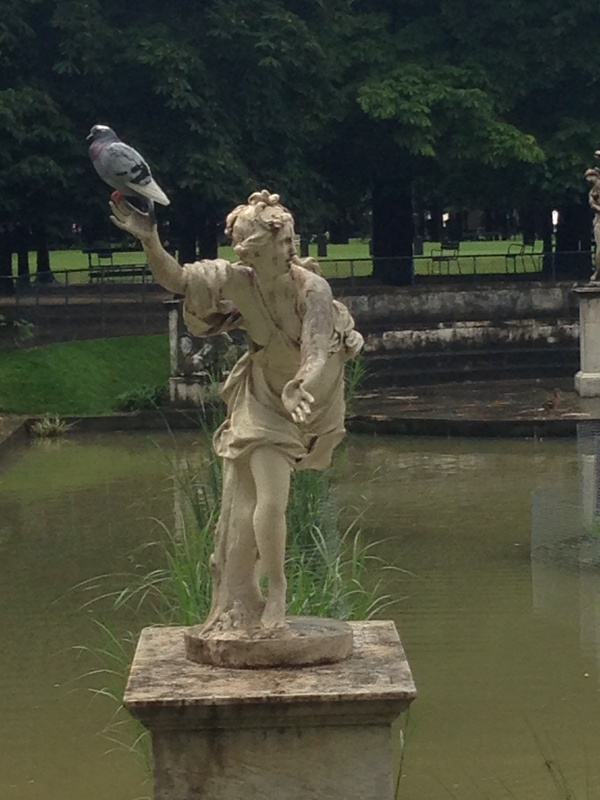 If only statues – in this case, Daphne, by Coutou – could talk. We were in Paris’ Jardin des Tuileries, and took shelter from a summer rain shower in the park’s La Terrasse De Pomone. As the deluge exhausted itself and the sun began to return, a plump pigeon decided this lovely statue was a good place to perch. After a brief stint on the nymph’s head, our fine feathered friend shifted to Daphne’s right hand … from which it would appear the bird is about to be lanched.